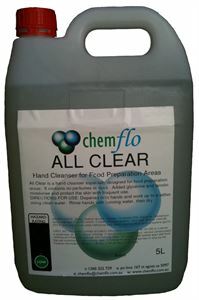 All Clear is an unperfumed hand cleaner and contains a special blend of cleansers that effectively removes grease, fat, flour and other soils without drying the skin. All Clear contains glycerine and lanolin to moisturise and condition the skin. It leaves the skin feeling smooth and soft.